A mind map consists of different nodes, which are connected to the parent nodes. A name of a new mind map is automatically set as the name of the central node. For more information on how to create a new mind map, please see Create a mind map. Struсture your mind map by adding new nodes or editing the existing ones. On the Edit tab, in the Node group, click New Node. Right click on the Mind Maps area and click New Node in the context menu. Use the keyboard shortcut STRG+N. In the Mind Maps area, the new node will be displayed, which is connected with the node that is currently selected. You can label the new node. Create your mind map faster by adding new nodes by using Copy and Paste in the Node group. Right-click the mouse in the Mind Maps area and click Edit Node in the context menu. 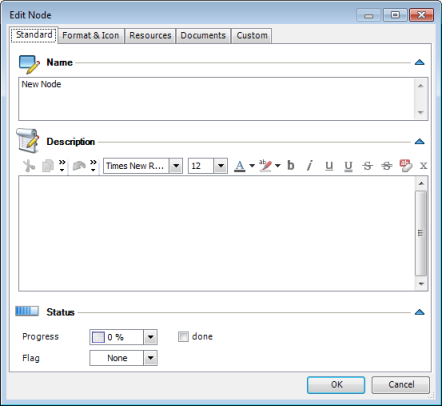 Rename the node by typing a new node name in the Name field. Enter additional information on the node in the Description field. You can format the text as you want. InLoox PM provides you with the range of the formatting features. For more information about these features, see Create and change comments, in the Customize a comment section. Click Progress to display a list of different degrees of completion and choose the suitable degree. You can also activate the done check box to display the processing status of the node. Choose from the Flag list a color to mark the node in the mind map. In the Format area, you can define the font, font size, color and the color of the node or the color of the frame. In the Icon list, choose different pre-defined icons such as basics, business or miscellaneous. This icon will be displayed in the node. Click the previously created custom field, e.g. work location, and enter a new value for it. For more information on how to add a new custom field in InLoox PM see Create a custom field. How to add and edit Mind Map nodes | InLoox PM 7 • Copyright 1999-2019 © InLoox, Inc. All rights reserved.